Arguably, hockey is the toughest sport in which to run a practice. (But go ahead: argue against it). The one thing it does have in common with other sports though is that every practice has dead time. This is the period that begins when you blow the dickens out of the whistle or shout out a lung trying to gather the little darlings to a spot where you will forever enrich their lives by describing the next drill. In hockey, this is often like herding cats. The dead time ends when you've exhausted your lexicon of euphemisms for fancy hockey terms, have drawn the loveliest of drills on a board, then dispersed the troops with a regal wave. In coaching parlance, this non-active dead time is a necessary evil. Eliminating it is virtually impossible. Minimizing it, however, is an art in itself. Some coaches get it; others try to; many can’t be bothered. Keep in mind that minor hockey coaches, for the most part, are well-meaning folks. They’ll watch over other people’s kids in a harsh environment and mostly deliver a decent sport program. This varies wildly but, let’s face it, in a volunteer-based system, one does what one can. But show them the value of reducing dead practice time and you might as well ask them to study videos of root canals - with apologies to readers who are dentists. Take the case of Barry, the coach of a competitive bantam team. He’d been pressed into service from a self-imposed semi-retirement when the original coach resigned. Cause of the resignation? He was bad with kids, an unfavourable trait for a youth volunteer. In cruised Barry laden with mounds of material. He started his first practice with a wonderful warm-up exercise to get the kids going and establish a tone. Said tone went instantly tone deaf when, for the next 18 minutes - yes, 18! - he had them gather in a corner around his little rink board. There he either read them excerpts from “War and Peace” or showered them with very tactic and system in his arsenal, which, he later said, would be the team’s playbook for the remainder of the season. This was in October. No amount of explanation could convince him that icetime was for movement and teaching, not dissertations. They had to learn. His mentor says, Barry, it doesn’t have to be in one bite - on the ice! They need to see what it takes to win, Barry says. Perhaps, his mentor agrees, but not that way and not for so long. This is my way, Barry says. He managed to reduce his dead practice time from about 40 to 25%. Still far too long. The kids tuned him out within a few practices. Barry was pulled from the team before Christmas that season and never coached again. 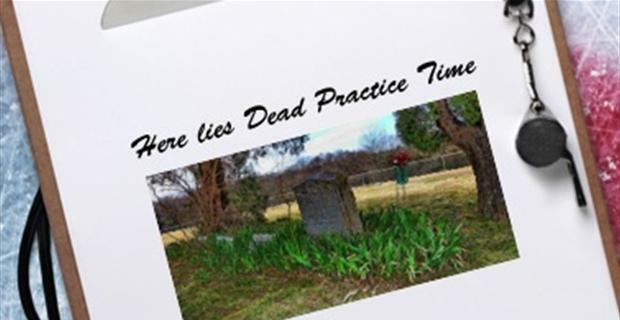 1 - How much dead time do you see in hockey practices? 2 - Why is it so important in hockey to have less than in other sports?